Pi Pie, created at Delft University of Technology, applied physics, seismics and acoustics. If Pi was a person, it must have been a pretty big name to have all these honours. Pi is the ratio of a circle’s circumference over its diameter and has been around for 4000 years which makes it more ancient than ancient Greece. Trying to figure out the area covered by a circle, the Babylonians were the first (that we know) to come close to it. Followed by the Egyptians and Greeks who by 250 BC knew they were more likely to approximate it than measure it to detail. Evidence of its universality, independent from the above attempts to measure pi have been discovered in China around 430 AD. The number of digits currently memorised by the pi champion is between 70,000 and 100,000 of its more than 13 trillion These are approximately 10-20 hours of reciting digits (poor referees). 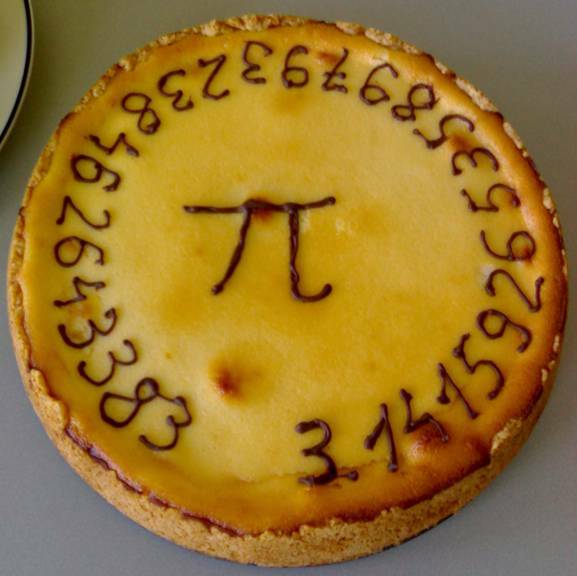 There is a website where you can find where your birthday is in pi. The obsession with finding patterns in numbers such as pi is linked to the human need of adding meaning to things.